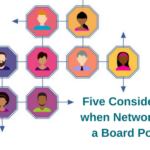 I hope you caught last week’s post on five considerations when networking for a board position. 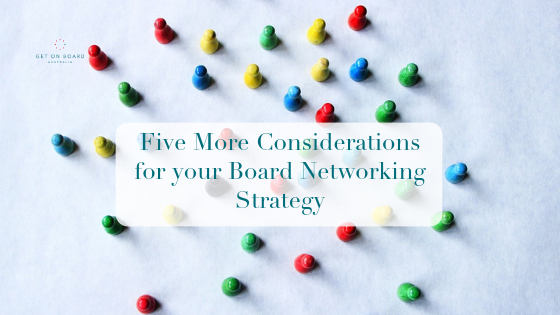 This week I’m sharing five more considerations you should be making when networking for a board position. This post is more about leveraging your network to find a board opportunity, rather than attending events for board networking purposes (which was last week’s focus). I really can’t stress enough how important your network is in relation to board opportunities becoming available to you. I encourage you to read this article and last week’s article to get you building and utilising your network more effectively to help you achieve your board goals. Starting with the end in mind is how you set yourself up for success when embarking on a board networking strategy. If you know where you want to go (i.e. the board or type of board you want to join), the path to that destination becomes much clearer. Before starting your board search, invest the time really thinking about and articulating the type of board(s) you want to join. It can be one board or three types of boards. Whatever it is, write it down. Everything else becomes much easier when you work from this end point (goal) in mind. This post on how to choose a board to join can help you get clarity. 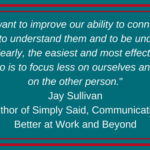 Once you know where you want to end up, you can more effectively tap in to your existing network. Who do you know is on a board in a space where you want to end up? Who is someone who knows someone who you want to get introduced to? Who else in your network may be able to support you on your board journey? You never know where a board opportunity may come from, so be confident to share your board aspirations widely. Read more on how to best use your network to help you find a board position. Think creatively and meaningfully and find ways to manufacture opportunities to meet the people you want to meet. I’m not suggesting being inappropriate, rude or inconsiderate; rather, be genuine and respectful. For example, can you volunteer in your ideal board’s organisation? Or connect with them on social media (LinkedIn is great for these purposes)? How about actually asking for introduction to them via a mutual contact? Always remember: be polite; don’t be forceful; don’t stalk; and respect their time and space. See if you can find a way to introduce yourself to the CEO or current board members to express your interest in joining the board. The speed of your results is correlated to how much time you invest on achieving your board goals. The more activity you generate on progressing your board goals – particularly on strategic networking, the faster you will likely see results. If there’s one thing I’ve noticed about building a board career, it’s that you can’t sit around waiting for a board position to land in your lap or have the expectation that the perfect opportunity will come your way. Usually you have to work for it. Your expertise and experience will most likely be the reason that you are considered for a board position. Investing in building your professional knowledge and capabilities, the greater the value you can offer a board and organisation. 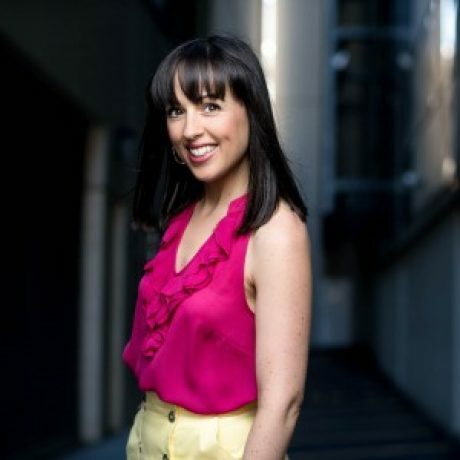 Create a proven track record of your professional accomplishments and utilise social media (e.g. LinkedIn for posting articles) or a personal website to showcase your awesomeness. This reputation will build your credibility and will speak volumes for you when you’re not there to be talking to the person directly. Watch this Facebook live on networking for a board position (ed: it may look scrambled, but it’s not!). Download the template via the link provided and use it to craft your personal board networking plan. Investing in building a robust professional and personal network (where they help you and you help them) will return you dividends when you begin your board search. What’s your next board networking move? Share in the comments below. 0 responses on "Five More Considerations when Networking for a Board Position"